This CellML model runs in both OpenCell and COR to reproduce the published results (figure 5). The units have been checked and they are consistent. This particular version of the model has an increased rate of osteoclast differentiation (D_OC_p) for the first 100 days, and the values for "model 1" have been taken from table 2 of the published paper. This CellML model translation was based on the author's original Matlab code and we would like to thank them for sharing this code with us. ABSTRACT: It is generally accepted that RANKL is highly expressed in osteoblast precursor cells while OPG is highly expressed in mature osteoblasts, but to date no functional utility to the BMU has been proposed for this particular ligand-decoy-receptor expression profile. 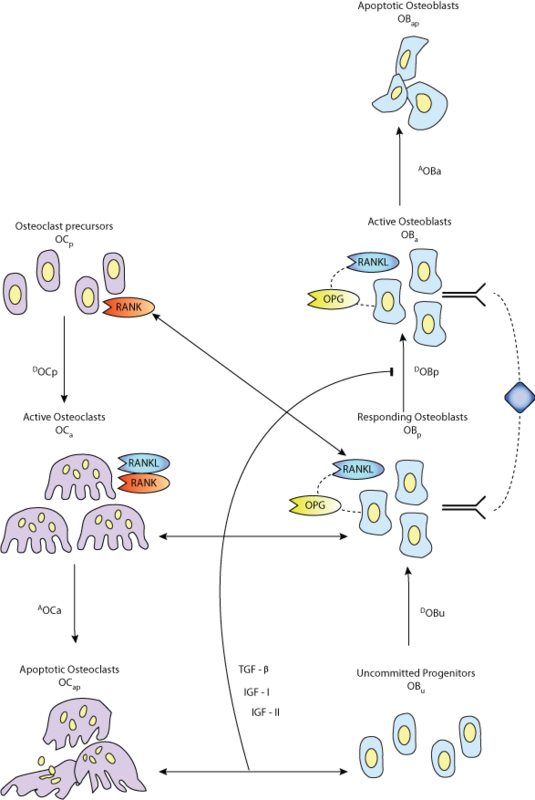 As discovered in the mid 90s, the RANK-RANKL-OPG signaling cascade is a major signaling pathway regulating bone remodeling. In this paper we study theoretically the functional implications of particular RANKL/OPG expression profiles on bone volume. For this purpose we formulate an extended bone-cell dynamics model describing functional behaviour of basic multicellular units (BMUs) responsible for bone resorption and formation. This model incorporates the RANK-RANKL-OPG signaling together with the regulating action of TGF-beta on bone cells. The bone-cell population model employed here builds on the work of Lemaire et al. (2004) , but incorporates the following significant modifications: (i) addition of a rate equation describing changes in bone volume with time as the key 'output function' tracking functional behaviour of BMUs, (ii) a rate equation describing release of TGF-beta from the bone matrix, (iii) expression of OPG and RANKL on both osteoblastic cell lines, and (iv) modified activator/repressor functions. Using bone volume as a functional selection criterion, we find that there is a preferred arrangement for ligand expression on particular cell types, and further, that this arrangement coincides with biological observations. We then investigate the model parameter space combinatorially, searching for preferred 'groupings' of changes in differentiation rates of various cell types. Again, a criterion of bone volume change is employed to identify possible ways of optimally controlling BMU responses. While some combinations of changes in differentiation rates are clearly unrealistic, other combinations of changes in differentiation rates are potentially functionally significant. Most importantly, the combination of parameter changes representing the signaling pathway for TGF-beta gives a unique result that appears to have a clear biological rationale. The methodological approach for the investigation of model structure described here offers a theoretical explanation as to why TGF-beta has its particular suite of biological effects on bone-cell differentiation rates. Schematic illustration of bone-cell population model: (a) osteoblastic cell line and (b) osteoclastic cell lines taken into account together with RANK-RANKL-OPG pathway (DOB, DOC...differentiation rates of osteoblasts and osteoclasts; EOB, EOC...elimination/apoptosis rates of osteoblasts and osteoclasts; RANKL binds to RANK and promotes differentiation of OCp; OPG binds to RANKL and so inhibits OCp differentiation). Derived from workspace Pivonka, Zimak, Smith, Gardiner, Dunstan, Sims, Martin and Mundy, 2008 at changeset b2ee51094e68.